We are in Minnesota for a much needed family vacation. I have to admit that it hasn't all been smooth sailing and that's mostly thanks to my body deciding that vacation = fall apart. I got a pretty epic summer cold and then my neck and left shoulder seized up, leaving me immobile for the past 3 days, thanks to a seven year old car accident injury. Did I mention that we drove from Denver to Minneapolis? Yep. It's been quite the trip so far. On the plus side, Riley is having a blast with his Minnesota grandparents, we all seem to be breathing a little easier now that we're getting settled in, the weather is perfection, annnnnnd there's this Wild Rice Salad. So it can't be all bad, right? I love wild rice. It's so beautiful and satisfying in a variety of dishes. Casseroles? Um, yes. Soup? Duh. Salads? Absolutely. Plus, it is one of Minnesota's claims to fame (for good reason). 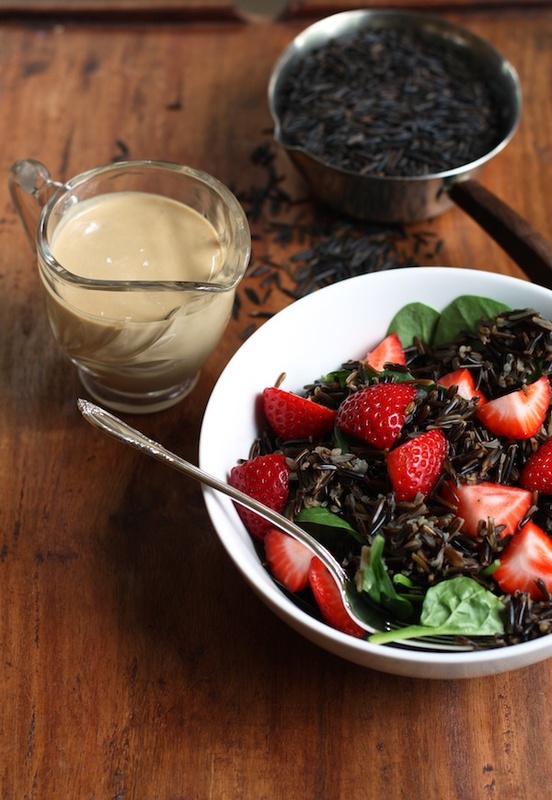 Here, I've taken cooked, chilled wild rice and tossed it with some baby spinach leaves, beautiful red strawberries, and a creamy, citrusy tahini vinaigrette. It's an ideal summer lunch that packs tons of flavor, countless health benefits, and it is 100% added sugar free. WIN. Citrus does some serious double duty in the dressing recipe: it acts as a sweetener and also adds a little acidity (along with some super healthy apple cider vinegar) to create a well-balanced vinaigrette. I only used orange juice but you could easily add fresh lemon or lime juice for a little extra zing. If you've never used tahini in salad dressing (it's most commonly used in hummus...surprise!) you should really get going on that. It's wonderfully creamy with a subtle nuttiness that adds oomph to salads, making them substantial but still light. If you like this recipe, stay tuned because I’ll be posting no sugar added/refined grain free recipes from now until August 11th. During that time, I hope to open your mind to exploring new ways to be kind to your body. After all, it’s the only one you’ve got! Combine the ingredients for the dressing in a small bowl and whisk until smooth. If the dressing seems thick, add another tablespoons or so of orange juice or water. In a large bowl, add the baby spinach leaves and top with the wild rice. Toss 2 or 3 times to combine. Top with the strawberries, drizzle with the dressing, and serve.